Edge Design has 900 followers! We are all so excited to be nearing 1000 followers that we decided a competition was in order to help us celebrate. 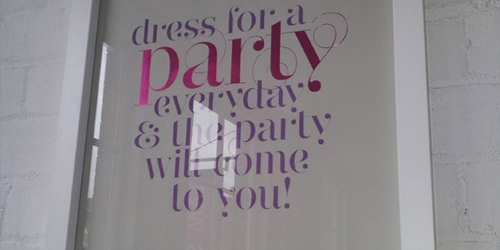 The next 100 people who follow us will be entered into a prize draw to win a beautiful framed Dress For A Party poster worth over £150! It will even be signed by Steve himself! Love it from Vermont, USA! Steve’s presentation at DesignThinkers, TO was phenomenal. This is a brilliant piece, lovely design, great message. Absolutely stunning! Who won it?